Aluminum bleachers elevated by several feet off the ground are the best choice for your stadium, field, and venue seating and here are several reasons why. Organized events are planned down to the last detail. Whether it’s a football game, baseball game, soccer match, or anything else that is going to take place at your venue, you’re ready for it. Everything is just right for the event. The field is perfectly marked and manicured, and you’re expecting a full house at your home field. When the crowd files in and are all seated, everything is good. Aluminum bleachers will give all fans a great seat for the game. Friends, acquaintances, rivals and community members alike will be there rooting for their team. However, sometimes the experience for spectators is not the best it can be. 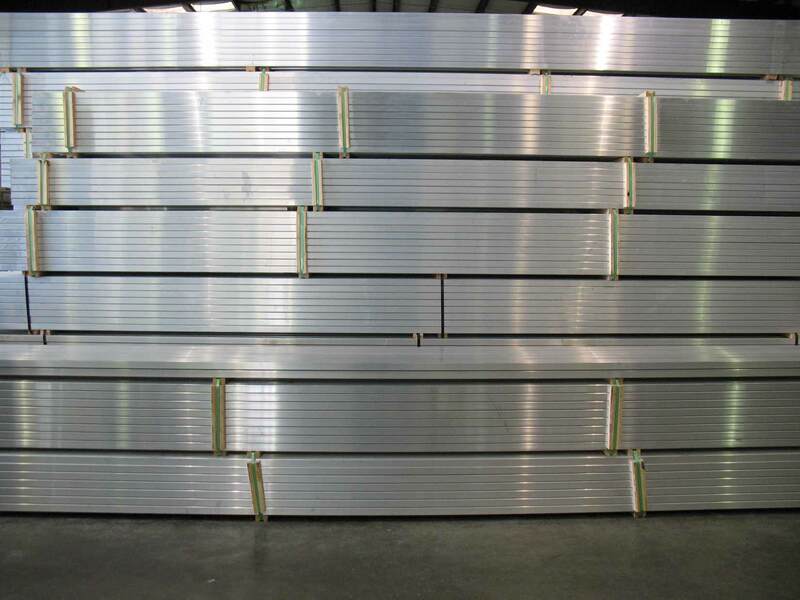 The great advantage with aluminum bleachers is that they can be erected quickly and moved to different locations. With any event expecting a large crowd, there are always people standing or wandering around, talking, catching up, or simply following the natural walking path to and from the restrooms and concessions area. Without being aware of it, they are, through no fault of their own, obstructing the view of those spectators seated in the first few rows of bleachers at ground level. But let’s face it. They’re not alone in their actions. The team members, coaches, and other game personnel simply taking their place and standing along the sidelines also will obstruct the sightlines of those seated at ground level. Sightlines are important for the fan experience. This key industry term refers to the ability of a spectator to see the field from their seat, over the people in front of them and also over people standing on the ground. Wouldn’t it be nice if all the fans that come to your facility to see the game could clearly see the action, free from the distractions and obstructions of pedestrian traffic? It is possible to sidestep these problems by installing elevated aluminum bleachers for your venue. By installing elevated aluminum bleachers, the first level of bleacher seating is located a minimum of 30 inches above grade level versus a 17-inch seat height on standard aluminum bleachers which allows your feet to be on the ground while seated. That extra additional height enhances viewers’ sightlines so that the first row of spectators can now see over those pedestrians wandering back and forth in front of the bleacher structure. That sightline improvement and increase in viewing angle leads to less strain, aggravation, and overall discomfort for the bleacher occupants. Elevated aluminum bleachers are built for safety. The first row of seating is constructed on the same level as the walkway, including guardrails and handrails. Stairways with handrails are constructed to reach the elevated first level. 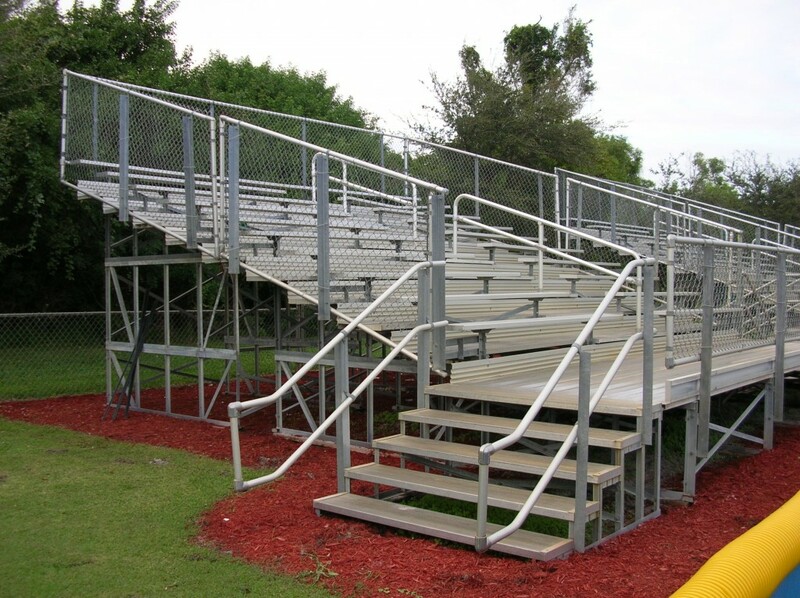 Elevated aluminum bleachers are completely compatible with ADA regulations, and can be outfitted with accessible ramps, walkways, aisles, risers, and platforms to meet current ADA codes and regulations. The safety and security of elevated aluminum bleacher systems are enhanced by available chain link fencing or vertical, picket-type fencing wrapped around the sides and back of the structure for fall protection and pass through code adherence. Yes, it’s true. Additional revenue generation can be a pleasurable side effect of elevated aluminum bleacher installation. You can make those elevated bleachers work and even generate additional funds by selling advertising space along the structure or as naming rights for specific bleacher sections. The space along the front of the bleachers, from the ground to the first, elevated platform, can be used as a billboard of sorts, playing home to advertising banners while helping to block off and secure the open areas underneath. The pathways up and down the stairways are prime, high visibility areas because of the amount of foot traffic naturally passing there during an event. With the bleachers being elevated, the entire structure becomes more visible just by its design. The banners, logos, and slogans attached to the structure will be seen not only by those that are using the bleachers, travelling in front of, and up and down the stairways, but also by all those in attendance, readily seeing the display from a distance while sitting in the other sections and locations on the opposing side of the field. Do your bleachers back up to a highway, heavily traveled street, or the parking lot? A logo, banner, or other advertising vessel stretched across the back of the bleachers can be used to reach out, inform, and appeal to the passers-by or patrons while parking. Use nameplates signifying which local business, group, or organization is sponsoring a certain section of bleachers. That section of bleachers will be referred to as the “company xyz” section for the season. Similar to those highway signs designating that a certain group is responsible for helping to keep a stretch of road clean, the same can be applied to sponsors of bleacher sections, showing the sponsor’s community involvement, goodwill, and local support. Corrosion resistance is built into elevated aluminum bleacher manufacturing, so much so that your new, elevated aluminum bleachers will demand very little maintenance for the first ten years of use. And because quality elevated aluminum bleachers are constructed from anodized aluminum, they can be expected to have a lifespan of up to 30 years, all while needing minimum maintenance. The anodized aluminum does not chip or flake off if scratched. Scratches occurring in the surface will not turn into rust and spread into further deterioration. 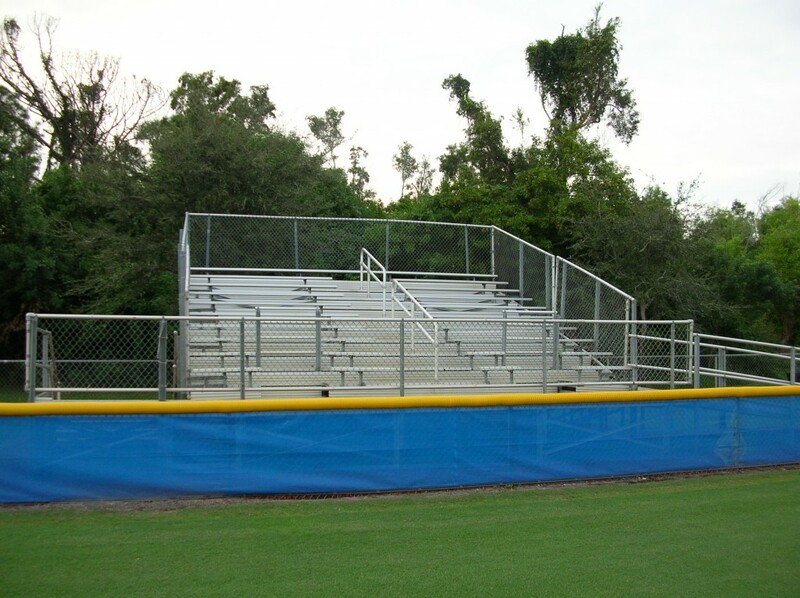 Aluminum bleachers are always the right choice for your group or mass seating needs. Quality, elevated, aluminum bleachers enhance the seating structure and increase the comfort level for the spectators. They are the perfect choice for sporting events like football, soccer, lacrosse, baseball, and any other on-field sporting event that will benefit from an elevated, enhanced viewing sightline. Elevated aluminum bleachers are the common sense option for any event, sporting or otherwise, that is played out at field level, increasing the possibility that pedestrians, coaches, players, stadium workers, media, security, and anyone else with field access will end up standing in front of the bleachers, at least partially blocking the view of some of the spectators. When you choose to install elevated aluminum bleachers, you put the comfort level and viewing experience of your patrons at the top of your priority list. When thinking about the safety and convenience of getting to and from their seats, to the comfort of those seats, and the ability to actually see and watch the action in front of them, clearly and unobstructed, elevated aluminum bleachers provide great solutions, great experiences, and great memories. Note: The expert team at Alumimumbleachers.com can also provide assistance with design and planning questions and spec sheets.